A paper jogger is an essential part of any paper handling job. They help reduce static and align papers perfectly for packaging, printing, collating, binding, etc. The Martin Yale 400 Paper Jogger is the perfect machine for anyone looking to jog up to a legal size sheet with a compact unit perfect for the office, print shop, copy center, or mailroom. A capacity of one full ream of paper eliminates the need for multiple jogs. The single-bin jogging machine is easy to use; simply place the paper into the bin and turn on the jogger. The vibrations will eliminate static electricity and align the sheets perfectly. 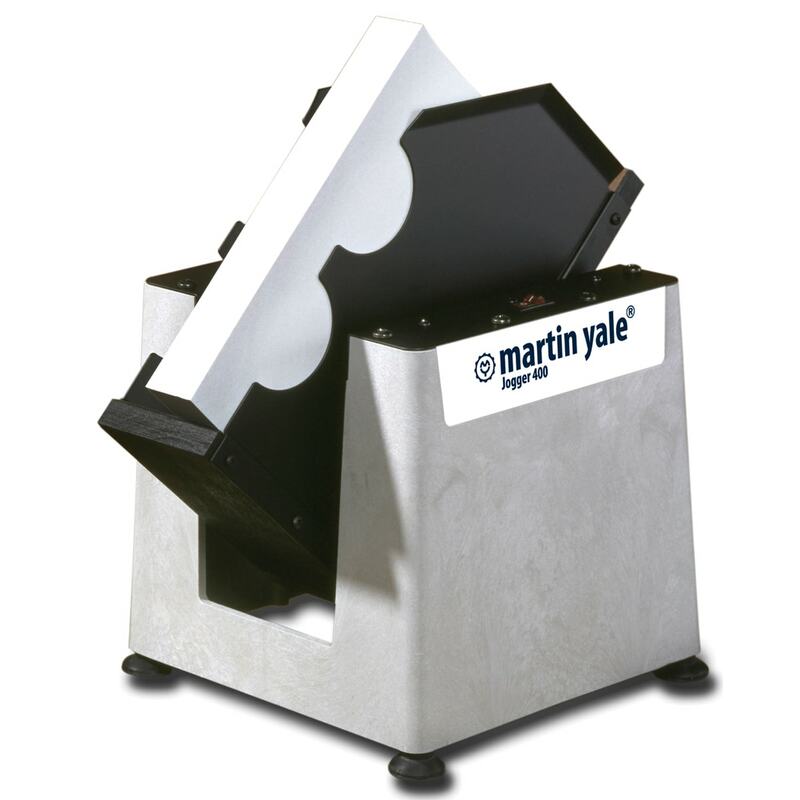 The Martin Yale Model 400 Paper Jogger is the perfect companion for copiers, folding machines, letter openers, folders/inserters, sheet counters, check signers and many other applications. It features isolation-mounted eccentric weight movement and self-aligning, oil impregnated bearings for strength and endurance, even for large jobs. The tilted tray ensures that the stack remains in the jogger and provides the absolute best results for even alignment. Additional features such as the hardwood and steel basket and high-impact one-piece shell make the Martin Yale 400 Paper Jogging Machine just another example of the Martin Yale quality, performance and value that users of all sizes have come to rely on. It only weighs 20 pounds and is small enough to fit on any desk or work space; perfect for when mobility and limited space are things to worry about. We are so confident in this paper jogger that it comes standard with a one year manufacturer’s warranty.